A person could be flat-footed in one or both feet. The condition is sometimes referred to as pes planus. Babies and small children normally have flat feet. The arch develops between the ages of four and six. 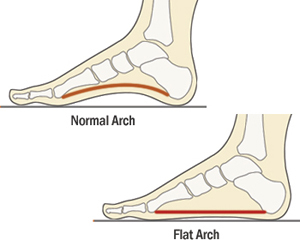 If the arch “falls”, causing the foot to flatten out, after a person reaches adulthood, the cause could be injury, illness, stress or pregnancy. It can also occur gradually as part of the aging process. Arch pain that is unrelated to flat feet can be caused by poor fitting shoes, high heels, injury or plantar fasciitis. If a person is born with flat feet or their arches never develop, there may be no detrimental effect. Running speed is not affected and there is usually no pain. When the arches fall in later life, it is accompanied by a great deal of pain. In both cases, there may be pain in the ankles, knees, hip and lower back, because there is less support and the feet tend to turn out at the ankle. Pain in the inner border of the foot is common, as well. At one time, parents were told that infants and toddlers should wear shoes at all time to prevent flat foot. The latest research indicates that going barefoot actually strengthens the arch. In all but the worst cases, walking barefoot on a sandy beach or similar terrain on a regular basis gives the feet a good workout and strengthens the arches. Of course, going barefoot can lead to injury. So, wearing properly fitted shoes with good arch support and low heels is the best solution and may help prevent adult cases of painful fallen arches. Orthotics, arch supports, braces and comfort insoles, combined with appropriate shoes are the best treatments for flat feet, plantar fasciitis and for “plain old tired, aching feet”. I purchased a pair of the Betterform arch supports and absolutely love them. They are very supportive and I no longer feel pain in my feet.